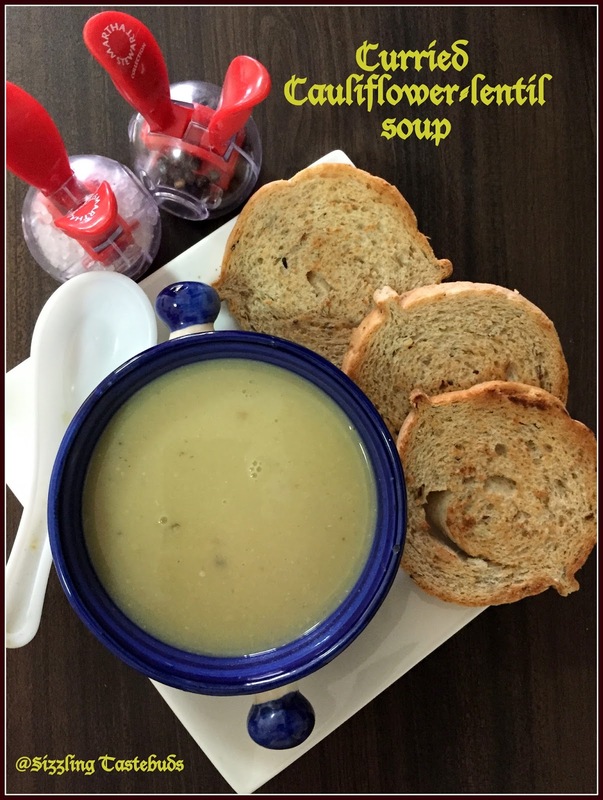 Kids Delight - Cooking with Wholegrains., and a giveaway ! 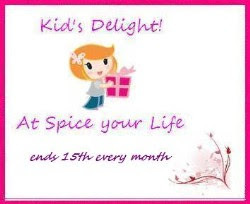 Happy to announce I would be hosting my blogger friend Valli's event : Kids Delight from 15th Oct - 14th Nov 2015. The theme would be cooking with wholegrains . 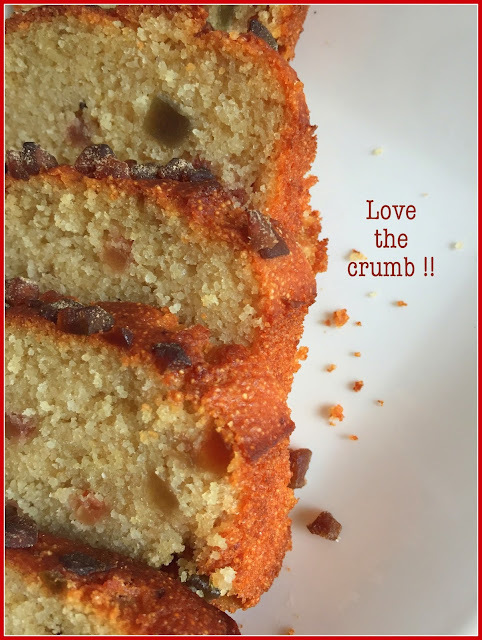 Its one of the themes very close to my heart and we have consciously chosen to bake / cook with whole grains at home . Whole grains contain the entire grain – the bran, germ and endosperm. Examples include whole wheat, oats/oatmeal, rye, barley, corn, popcorn, brown rice, wild rice, buckwheat, triticale, bulgur (cracked wheat), millet, quinoa, and sorghum. Many whole grains are good or excellent sources of dietary fiber. Most refined grains contain little fiber. Dietary fiber from whole grains, as part of an overall healthy diet, may help improve blood cholesterol levels, and lower risk of heart disease, stroke, obesity and type 2 diabetes. Dietary fiber can make you feel full, so you may eat fewer calories. Including whole grains in your diet plan may help you reach or manage a healthy weight. B vitamins (thiamin (Vitamin B1), riboflavin (Vitamin B2), niacin (Vitamin B3) and folate (Vitamin B9) are important in a variety of biological functions. Selenium is important for a healthy immune system and regulating thyroid hormone action. It’s important to include a variety of grains in your eating plan because grains differ in their nutrient content. 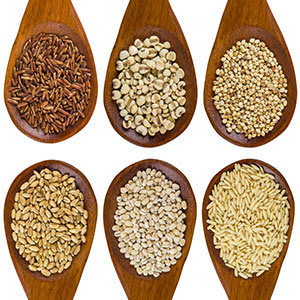 Whole grains can be a good source of fiber, but refined grains usually are not. 3) Entries need to be posted between 15th Oct and 14th Nov 2015. 4) Kindly link up this event announcement and Valli's Kid's delight announcement to qualify as an entry. 5) One qualifying entry shall be randomly chosen as a winner. Winner shall be announced by end of Nov. It had been a while since I baked a sweet bread for the girls, and right there in my inbox were flooding “recipes for Fall”. Now where I live, its possibly the hottest month of the year (with Oct temp reaching as high as 42-44 deg C). Be it as it may, just when I had decided to make these, I had run out of flour !! What was I thinking , you wonder :) Well I discovered a great substitute for both the butter (which was there, but in teeny weeny quantities) and the all purpose flour (which I personally prefer to substitute with wholewheat in most recipes). Plus we had homemade pureed Pumpkin ,so that was a great replacement for the eggs as well. 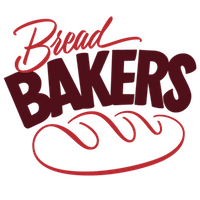 Sending this over to Bread Bakers Challenge -Oct hosted by Wendy. Prep time : 15 mins . Baking time : 25-27 mins (varies from oven to oven). Sieve the flour, semolina, baking soda, cinnamon powder, all spice, baking powder and salt. Keep aside. In a sauce pan, melt the butter and slightly burn it. 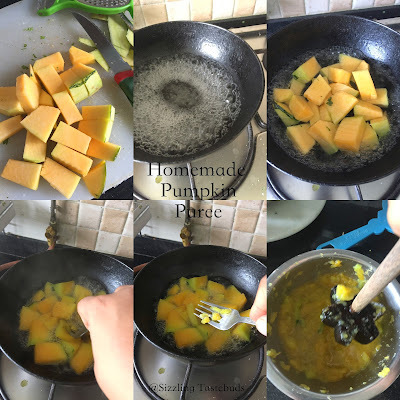 When its almost burnt, turn off the stove, add in the pumpkin puree and sauté it well . Keep Closed for 5-6 mins till the burnt butter is infused in the pumpkin puree..
Now mix in oil, yoghurt, powdered sugar, floured nuts into the pumpkin puree. Mix well and now slowly fold in the sieved flour- semolina mixture. Mix slightly (due to semolina you would have a rather thickish mixture) and pour into prepared bake tins / loaf pans. Ratatouille is usually served as a side dish, but may also be served as a meal on its own (accompanied by pasta, rice or bread). Tomatoes are a key ingredient, with garlic, onions,zucchini, eggplant, bell peppers, marjoram, fennel and basil, or bay leaf and thyme, or a mix of green herbs like herbes de Provence. Ratatouille can be eaten for dinner, but is also used in breakfast and lunch settings. There is much debate on how to make a traditional ratatouille. 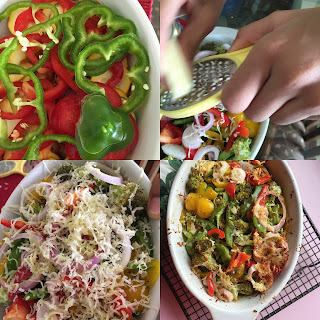 Today we kept it simple - a medley of vegetables grilled with some cheese. It was delicious on its own. You could also pair it with some red wine and grilled bread to make it a complete meal. This dish could also be made on the stove top or baked - I chose the latter. Prep time : 20 mins, Baking + standing time : 15 mins. Grated cheese - 1 TBSP (optional). Blanch the tomato, skin it, dessed and chop fine. Mix a tsp of olive oil, pinch of salt and keep aside. 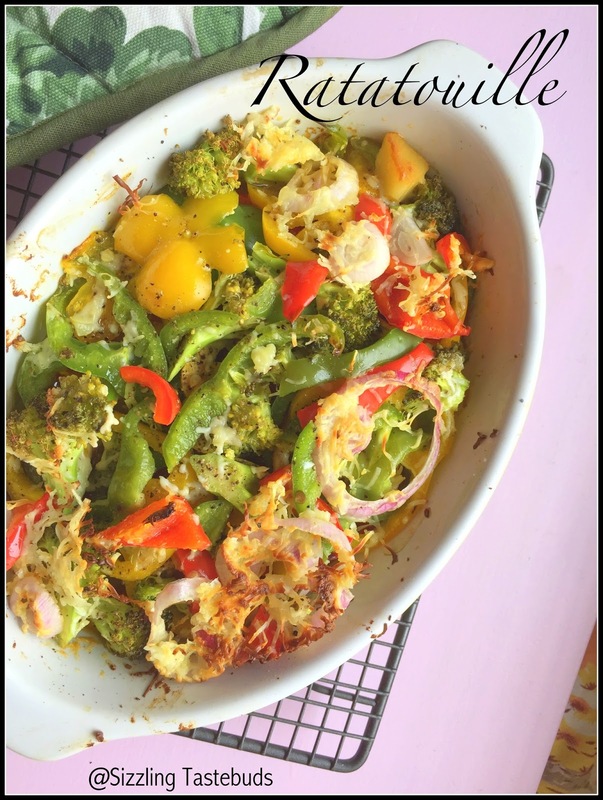 Slice all veggies except broccoli into roundels of equal thickness -not too thin or thick. In a skillet, add 1/2 tsp of oil. 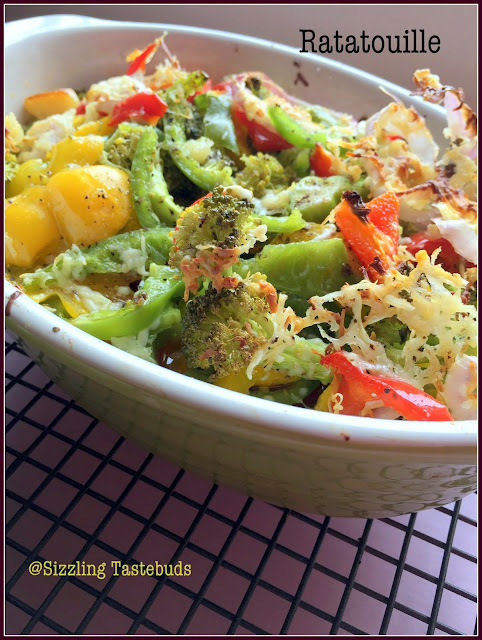 arrange these veggies gently, sprinkle little salt and without disturbing them, let them cook for 2-3 mins. switch off the flame. Meanwhile heat oven to 160 Deg c.
Grease the baking dish with the rest of the oil, spread the diced tomatoes, add the crushed garlic, and arrange the slightly warmed veggies one by one in a nice layered kind of dish. Top with broccoli , salt and bake at 160 for 25-30 mins (tent this towards the end if required). I suddenly found myself with lots and lots of cauliflower with both me and the husband both lugging back this versatile vegetable. When we had exhausted parathas, curry etc, I was looking at few offbeat ideas and this curried cauliflower soup from Food 52 (the theme this week for Blogging Marathon) appealed to me a lot. 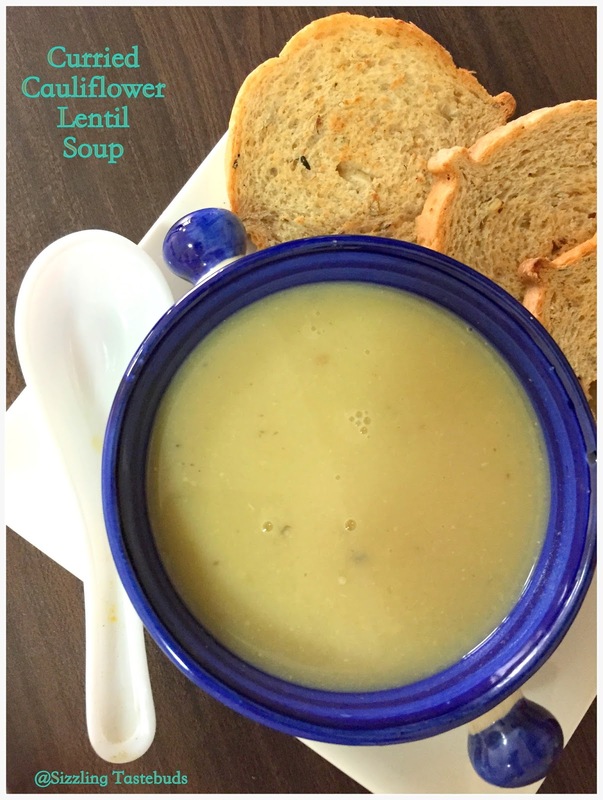 I made my little variation of adding pureed lentil broth and that gave it a buttery smooth yet light finish. 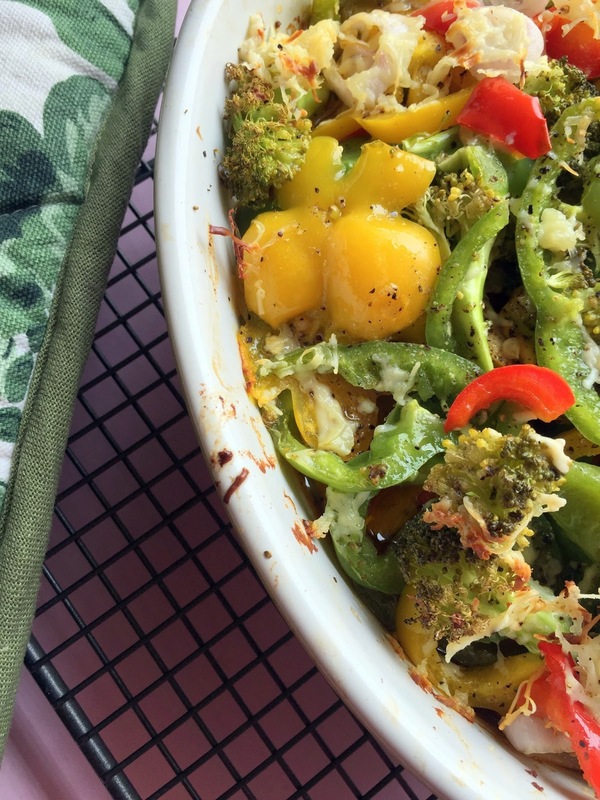 Serve it with chunks of curried Cauliflower (which I totally forgot) and some toasted breads and you have a healthy dinner option ! Lets head to the recipe while this makes it way to Blogging Marathon 57 this week. We had a deadly BM56 with mega events through the month. Here's the recap. In a pan, heat half the oil. Saute the cauliflower, add salt and crushed coriander seeds, cumin powder, paprika and saute well. Sprinkle water and let it cook al dente. (in the original recipe, the florets were tossed with salt,oil and pepper and baked for 25 - 30 mins at 220 C/ 450 F till crispy). Meanhwile, pressure cook soaked lentils for 2 whistles (or till tender but not mushy). Retain the lentils with the cooked water. Puree the cauliflower with half of the vegetable stock leaving a few crisp florets for garnish. In a pan, add rest of the oil. Saute onions, add cauliflower puree, spices (if needed), rest of the vegetable stock, cooked lentils and simmer well for 10-12 mins. Finish with milk and add salt and pepper to taste. Let it stand for 5 mins before serving. Top with croutons or curried cauliflower. Pumpkin Puree is invariably the first of the solid foods introduced to an infant. 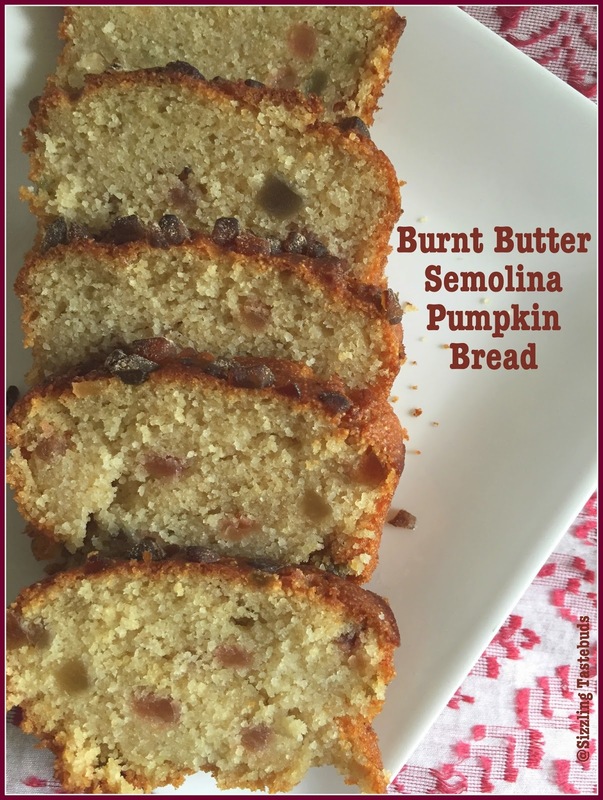 Easy to digest and easy to make, I have been using this as a great egg replacer and we loved our Pumpkin - Chocochip bread . I make it in two ways depending on how much time I have, and the quality of the veggie. Longer time window means I bake the chunks for about 30-40 mins, cool them and puree it. Today's method is stove top when I have both lesser quantity and less time on hand. The pictures are self explanatory, and there are no measurements, so am just noting down the process, briefly. Let them boil / simmer till fork tender. Shahi Paneer Masala & Eastern Spices Product review ! 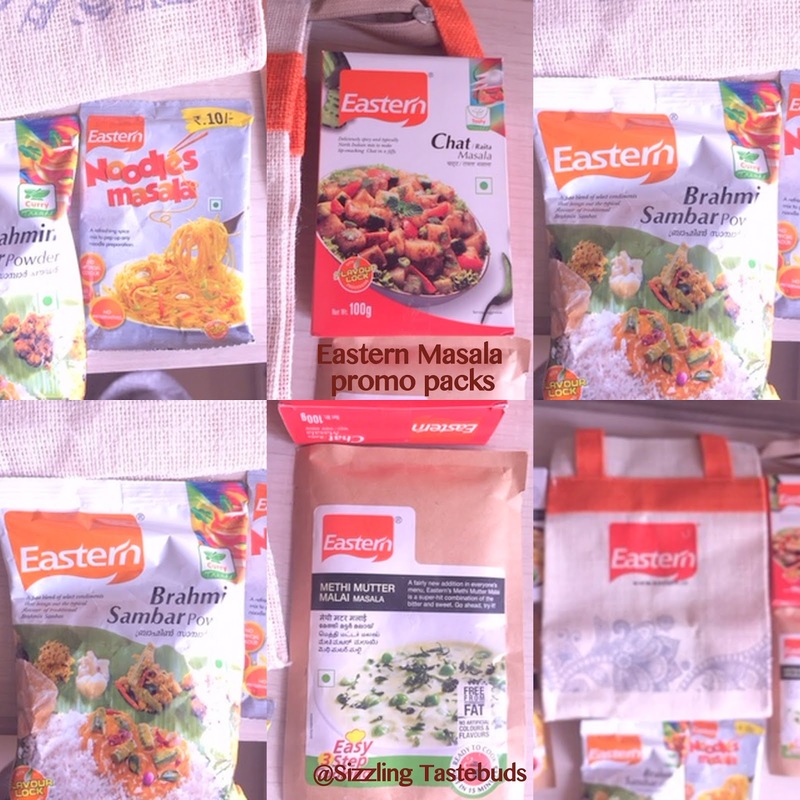 The first thing that was striking about the hamper was I got not one, not two but several masala packs to review- Chaat masala, Brahmin Sambhar powder, Shahi Paneer Masala and the like – all neatly wrapped in a jute bag and the packs themselves were very attractive to look at. Thank you Eastern, and Aveta. Although long overdue, here’s the first of the reviews. The others shall follow shortly. , And here we are reviewing the first product that came in my hamper – Shahi Paneer Masala. 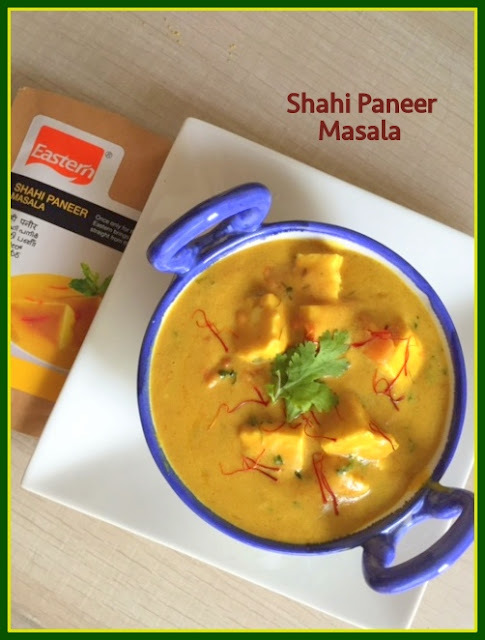 Paneer is an anytime favourite at home – Palak Paneer / Parathas / Frankie/ Gulab Jamun / Kebabs / Paneer Pulao– pretty much everything with Paneer is quickly lapped up at home. · Easy to understand instructions (literally step 1, 2 and 3 and you are done) ! · Also, the salt and other condiments used was not overpowering. 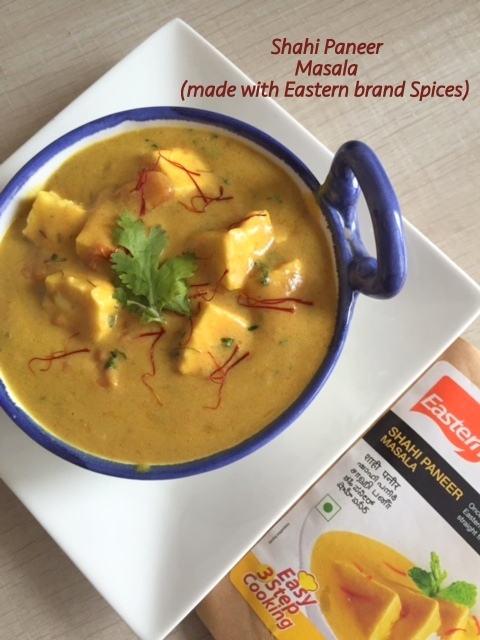 Cut a pack of Everest Shahi Paneer Masala into a bowl. Whisk well with 1 cup of milk into a lumpfree mix. In a pan heat oil and sauté cubed tomatoes. Let them soften a bit. Take it out and sauté paneer cubes in the same oil for just 1-2 mins. 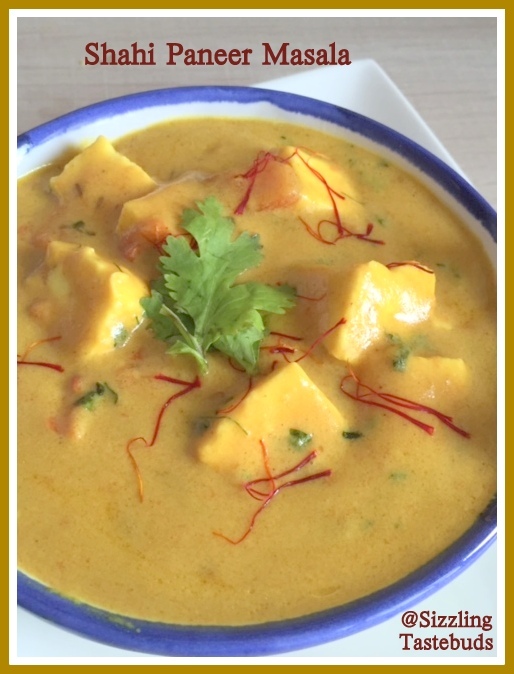 Reserve the paneer cubes in warm water. 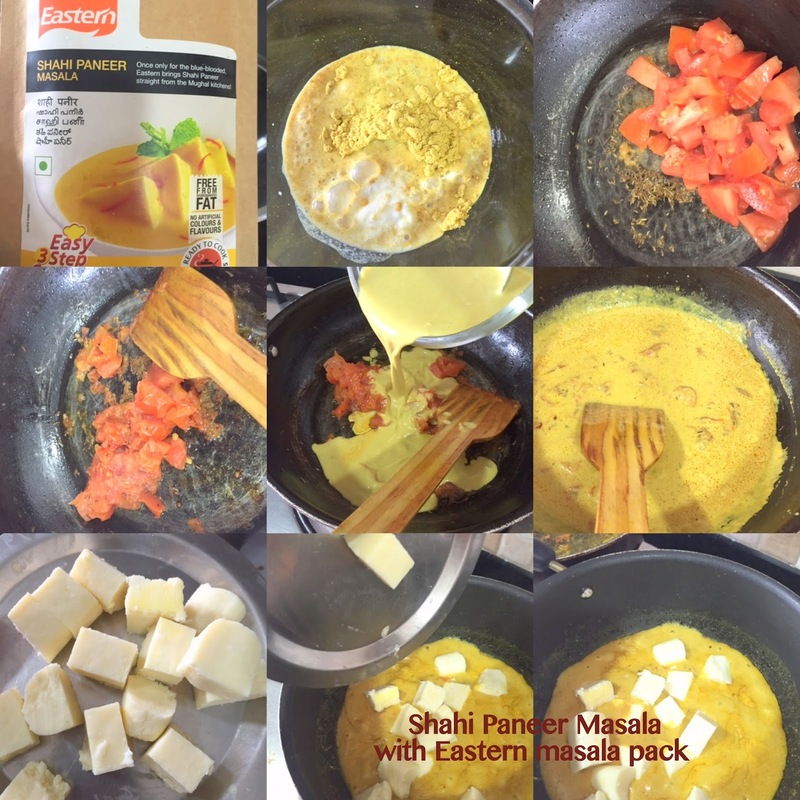 Now add the shahi paneer masala mixture . Mix and let it cook on simmer for 6-8 mins. Enjoy it with hot rotis or even veg pulao.